In January 2015, The Hague Institute initiated new field work in Zanzibar. As part of the ‘Governance of Climate Adaptation in Small Island Developing States’ project, carried out under the Conflict Prevention Program, researcher Sieske Valk will spend 10 months collecting data and co-organizing multi-level stakeholder discussions to address best practices on the governance of climate adaptation in Zanzibar. In the first part of the project, Sieske is co-authoring a baseline assessment of the vulnerabilities and Climate Change perceptions in Zanzibari society. Insights from this will be then used to organize Participatory Planning workshops on devising local climate action plans at several locations. A sudden screeching sound makes me jump up from behind my desk at home. The immediate silence after the high pitched screech terrifies me and I fear a worst case scenario: a cat has met its maker. Running outside to treat the victim with one of my best skills – providing first aid to an injured animal – I discover the nerve-racking sound was nothing more than the steel on steel of scooter brakes in full action, at the last moment. On the corner of the street a Vespa-like scooter is standing right-angled on a Ferrari-red motorcycle. The murmuring starts, as does the shouting of accusations. Fortunately, apart from a few scratched limbs, no man, nor feline is hurt. Only a few weeks living in Stonetown, Zanzibar and the inevitable witnessing of my first crash has already happened. To be honest, it was not really the first crash between motor vehicles I have witnessed on the island, but it is the first one within the maze of Stonetown. 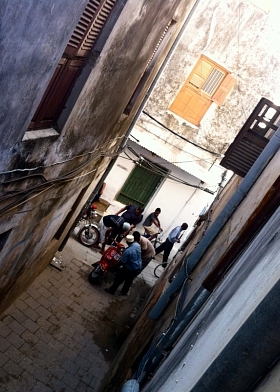 This historical part of Zanzibar City, is known for its narrow, winding alleyways. I have yet to experience my first walk from A to B which doesn’t guide me past Q and K first. That is, of course, also the attractiveness of the town: you never know what you are going to get and as long as you know where the seafront is you will always hit home base. The alleyway my balcony is overlooking is a busy one. It is just behind Jaws Corner where throughout the day men come to talk politics, drink coffee and play Domino’s or Bao. There are constantly people walking, cycling and driving their scooters underneath the balcony (the alleyways are too narrow for cars). The buildings are all stacked upon each other, creating crossroads where no one can see what or who is around the corner. 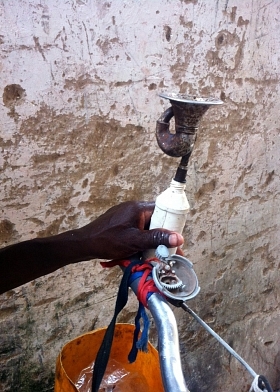 The Zanzibari people created a curious system to let others know they are coming round the corner: they honk, ring their bell or yell something in the likes of Hodi Hapo!, “Hello there!”, when they are nearing a junction. This way the person on the other side will know that he or she is not alone. Although a similar system can also be observed in Asian cities where not honking persistently equals getting ignored, the unwritten rule of making noise before a corner which is used in Stonetown is surprisingly efficient and effective.